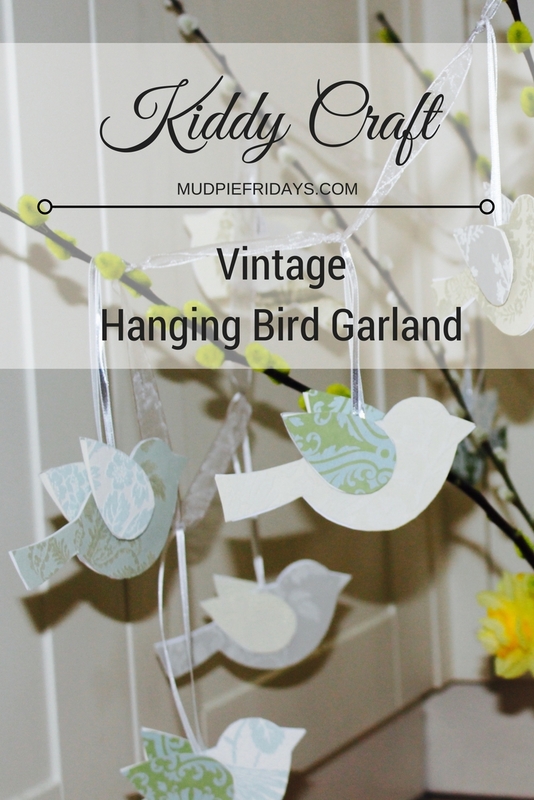 DIY Vintage Hanging Bird Garland: Before I started blogging I use to be a keen scrapbooker. However since blogging has now taken over every waking hour that I am not with the kids or working I have a huge amount of craft supplies sitting in my office going to waste. So when Bostik said the theme this month was birds I thought it would be the prefect opportunity to use some of my vintage papers. 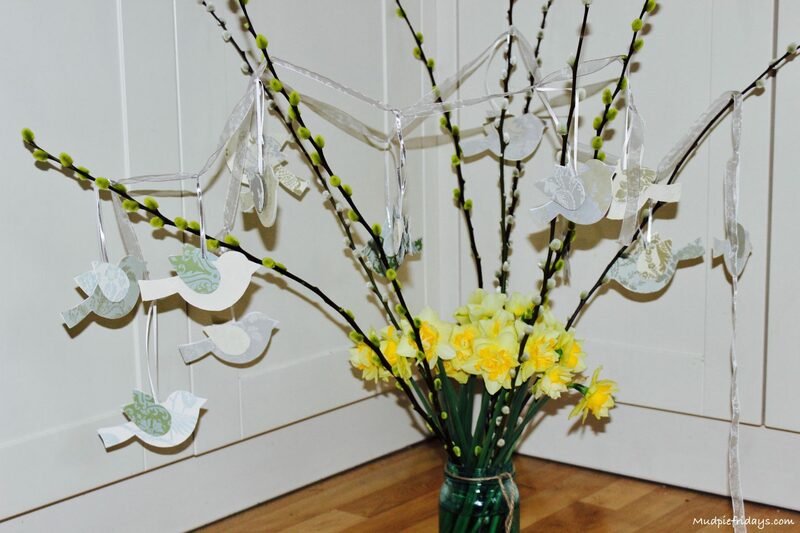 I had also envisaged a bit of mummy time putting together something pretty as a gift. In the end my friends girls aged eight and ten helped assemble the project, which was probably turned out to be a lot more fun. Monkey also got involved dishing out glue dots to everyone. 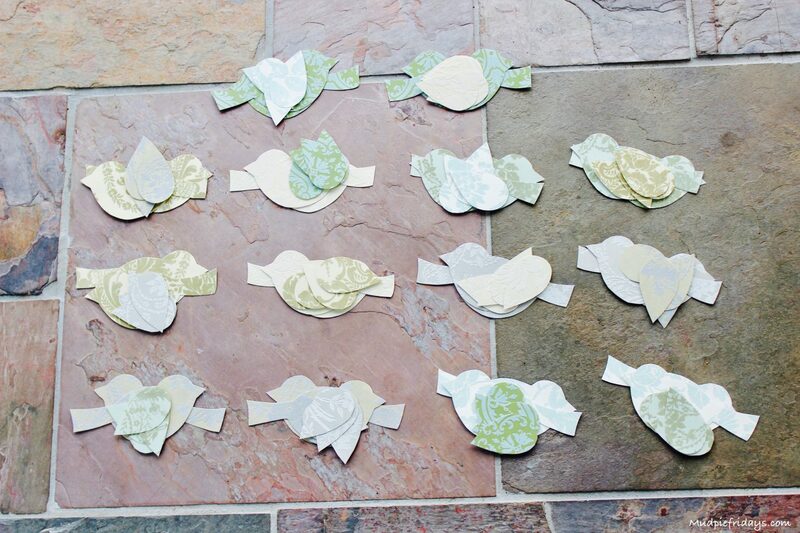 Step 1: I had seven different papers so opted to make fourteen birds two of each design. My papers were not that thick so I also had some white card to make the birds more sturdy. If you are using scrapbook card or have double sided papers then you can make a decision on perhaps altering the way the birds actually go together to accommodate your preferences. I drew round the blank fourteen times onto the white card and then twenty eight times on the back of my flocked paper. Remember that because you have two sides you will need to place the birds with beaks pointed towards each other so you have two left sides and two right sides. To make the wings I drew a large tear drop as symmetrical as possible, to make fourteen you will need fifty six wings in total. 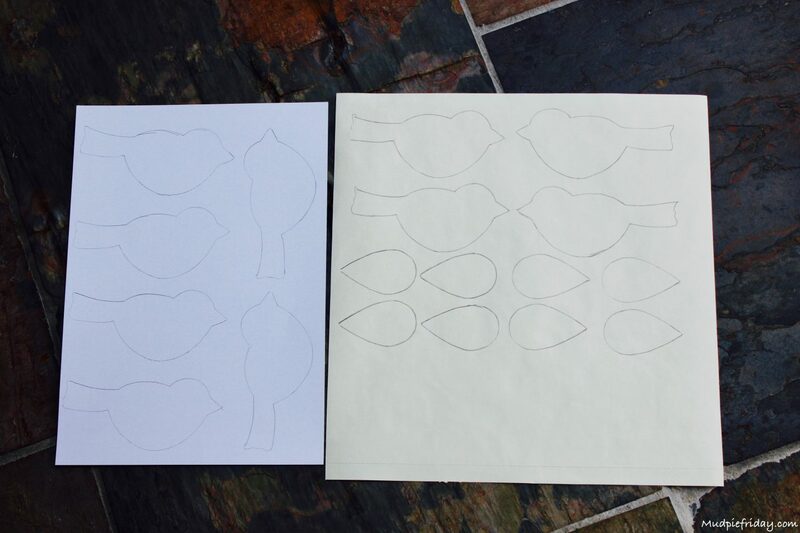 Step 2: The next step is to cut them out. I tried to stick to the lines as much as possible so that when put together there wasn’t too much trimming that would need to be done. This does take a fair amount of time so be warned although I found it theraputic! Once cut out I placed all the bird pairs I placed them in their pairs and added the wings. I was keen not to have any two papers the same so fiddled around with them until they looked right. 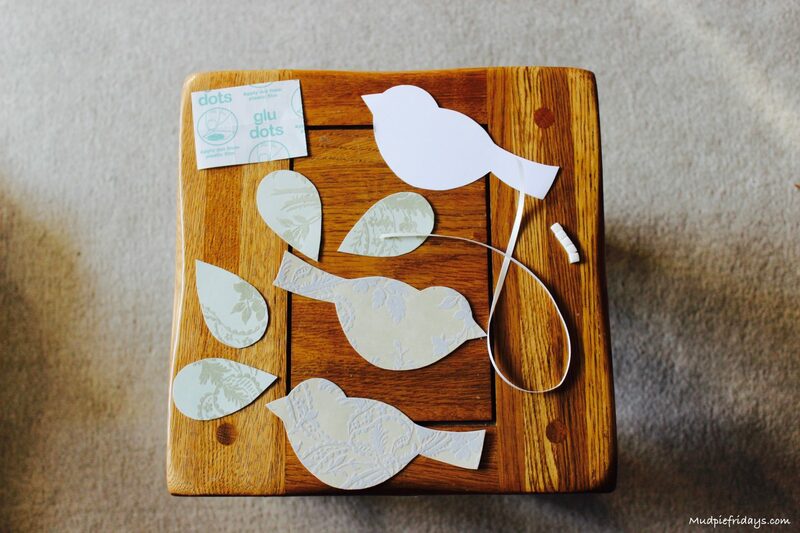 Step 3: Can be a little fiddly, to assemble one bird you will need the white card centre, two patterned birds, four wing pieces some glue dots and foam pads and a length of ribbon. I did not measure the lengths of ribbon, the different lengths made it more interesting to the eye. 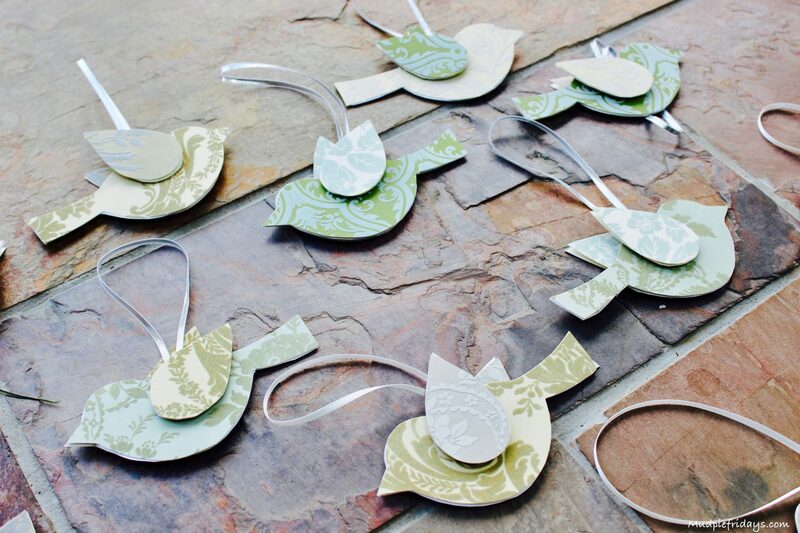 To assemble, add a glue dot to each end of one of the patterned birds. The glue dots are really easy to work with and it saves getting white glue all over the paper and ruining the flocking. Once the bird is stuck to the white blank, on the reverse I add two further glue dots in the same place as before. Plus an extra one in the middle to secure the ribbon. Because the backs of the wings will be visible add two wing pieces together with a glue dot and then use foam pads to attach to the bird. I put the wings at slight angles to make them visible from each side. Step 4: Once call your birds are complete tie them onto your other piece of ribbon. I tried to make the distribution roughly even. Fourteen birds gave us a length of around two metres. 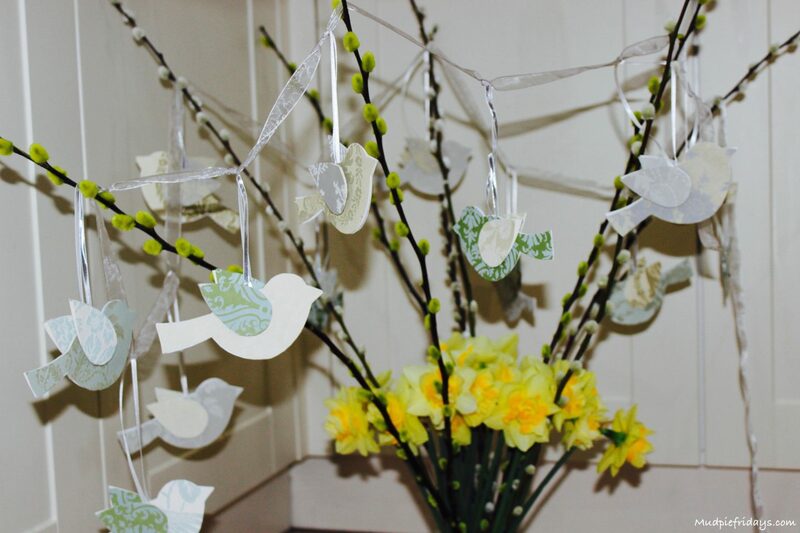 These birds are destined for my friends girls bedroom, but they would make a lovely decoration for a Wedding, Easter, Spring or Summer party. 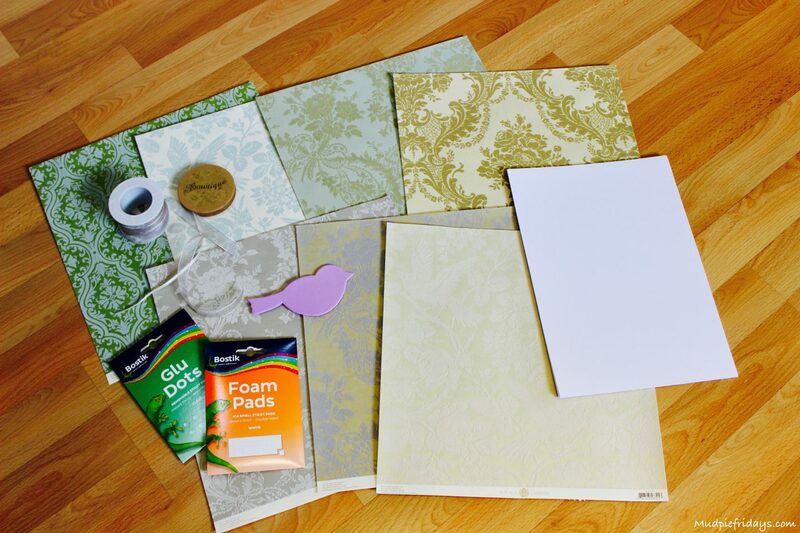 The beauty is you can pick papers to match whatever your theme is so can make them match any decor you would like. They are definitely something I will making again especially as the girls loved them. I love these! As Kim says above, they would have been perfect for my wedding too! 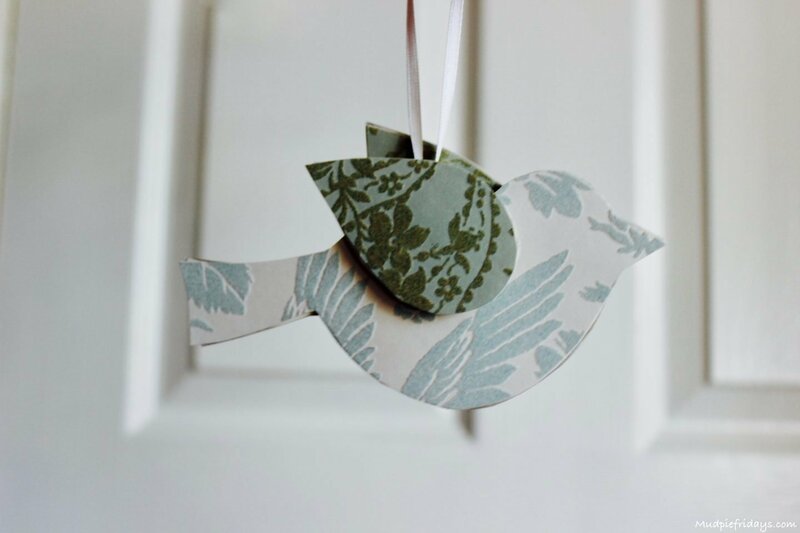 With our surname being dove we had bird shaped name cards and various other little touches, I think I’m going to try and make these just to decorate our home! They are too cute!! These are so cute. I love the vintage paper you’ve used – I don’t think I’d have the patience to make them I’m a rubbish cutter but I’d love to hang them! These are so pretty and right up my street as I love anything crafty! I think they would make lovely Christmas tree decorations too and you could use festive paper.